What it lacks in new features it makes up for in improving old ones, such as a better experiences in the Matrix as well as improved interface options. Players who have already taken this trip with Shadowrun Returns and its expansion may find themselves wanting a bit with the gameplay, and newbies will have quite the learning curve to surmount, but if you see the gameplay as an adequate means to experience the more satisfying narrative end, Shadowrun: Hong Kong more than earns your attention. If you've been round the neon block a few times already, then Hong Kong's going to feel pretty familiar, despite being perfectly solid and having a few new toys plus a wider, more ostentatious stage than ever before. A fantastic isometric CRPG that has a very well developed story and great varied combat that just might be a bit on the tedious and boring side for those not wanting walls of text to read through. Harebrained Schemes has again struck gold within the Shadowrun universe. Refined Decking and brilliant writing as well as some genuine surprises breathe life into the fantastical future Hong Kong setting. Sadly, some pacing and level design issues stop it just short of the heights it was reaching for. If you loved Dragonfall, you're going to really like Hong Kong. 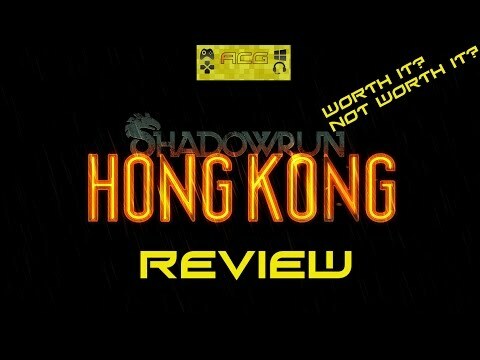 Shadowrun: Hong Kong lives up to the reputation of its predecessors and remains one of the best RPG series in recent years. Shadowrun: Hong Kong may be a familiar cyberpunk paradise for some and an altogether alien destination for others. However, for tactical RPG fans, it's still home sweet home. This is a game that transcends its name and should be spoken of in the same breath as the genre's best. In years to come people will be comparing the new cRPGs to Hong Kong, because it's easily a benchmark for what developers in the RPG arena should be looking at when designing their games. Definitely one for newbs and phreaks alike. Just like the previous two games, Shadowrun: Hong Kong has stayed with me when I'm not playing it. The flawed, moody characters and the clever use of Asian magical traditions got into my head, and when it finished, I missed all of the main characters. It takes a pretty cool game to do that. For that intensity and depth to be maintained over a series of three games is pretty remarkable. A thoroughly enjoyable, if slightly dated, cyberpunk story that consistently strokes the heartstrings and funny bone. The story and narration is compelling and simply urges you to press on. Shadowrun: Hong Kong improves upon a nearly-perfect RPG formula to deliver new action to old fans while keeping things accessible for new ones, too. 'Shadowrun: Hong Kong' is an old-school style strategy experience with one of the most interesting settings in contemporary tabletop gaming. Instead of expecting the license to do all of the heavy lifting, Harebrained has instead created a good game and then set it into the mythos of 'Shadowrun'. With the inclusion of the Unity editor, this platform will only get better as time goes on.